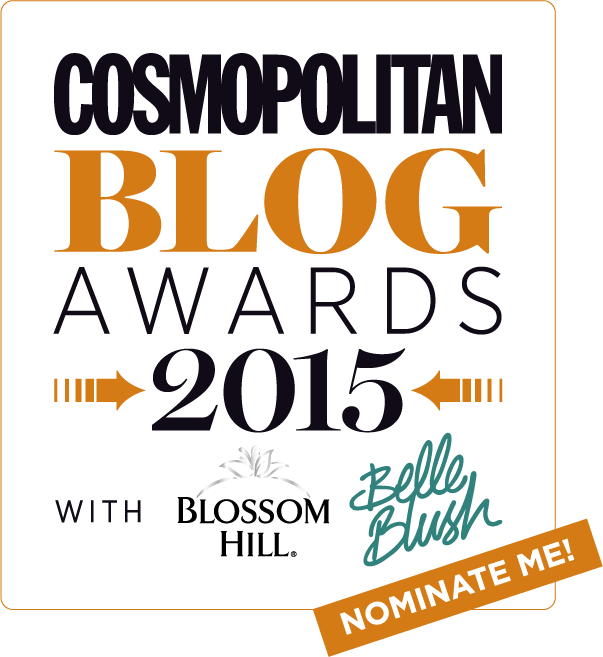 It’s that time of year again – the Cosmopolitan Blog Awards! I attended the awards last year and what a great night that was. Along with the usual nibbles, drink, hair and nails treats…it was particularly lovely to connect with other like minded people. At that point my blog was fairly new and I was still getting to grips with all of this blogger business. Meeting other bloggers and seeing where their work had taken them really gave me the kick up the backside that I needed. I was definitely inspired to get my blog up and running properly. Since then I have redesigned this website to make it easier to navigate and more visually appealing for you readers (I hope! ), with a little help from the lovely folks over at pipdig. My mindset has changed and I now have a little blogger fairy who lives on my shoulder. She constantly reminds me to look out for good shots for the blog and convinces me to buy more beauty products (that’s how I justify it anyway). What I am trying to say is that I now think like a blogger, living and breathing every moment trying to find inspiration and new content to excite me and my readers. I now seem to photograph EVERYTHING, yes I have become that annoying person who won’t let you eat your food until a thousand pictures have been taken. I also can’t seem to walk through a beauty hall without my hands, arms and occasionally my face looking like the makeup monster has thrown up all over me. The best part is that I absolutely love every minute of it. I am incredibly passionate about beauty, bordering on obsessive! Since starting this, I have met many other people who are just as fanatic and excited about beauty as me – it makes me feel sane again. I’m allowed to get ridiculously excited about a concealer now and it’s totally acceptable – Hoorah! I have had such a lovely response from my readers and especially my Instagram followers and I appreciate every single one of you. To vote for www.littlemissplumful.com in the ‘Best for Beauty’ category, click here. Cheers big ears!